The fire was limited to a local area inside door 2R. 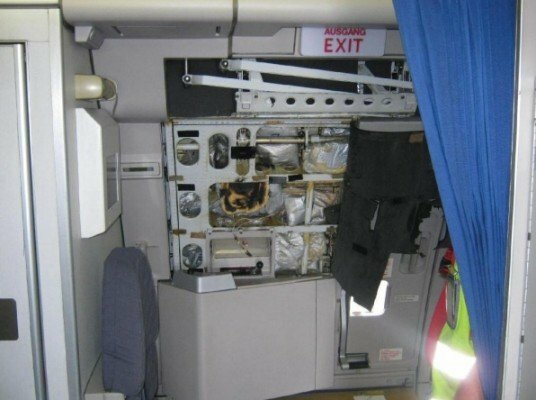 A fire caused by a short circuit due water ingress in an Airbus A330 forced the crew the carry out an emergency landing at Düsseldorf, Germany in August 2011. The Airbus A330-322 was operated by Air Berlin as flight AB2050 from Düsseldorf (DUS), Germany to Tenerife (TFS) , Canary Islands, Spain. The flight took off at 12:21, carrying 383 passengers and eleven crew members. Shortly after takeoff, a cabin crew member seated near door 2R heard a noise and noticed blackening on the inside of the door. Smoke appeared and flames were visible. The flight attendant reported this immediately to the senior flight attendant . The flight attendants seated near doors 1L and 1R rushed to the fire and helped to spray the fire using the halon fire extinguisher. It still appeared to be smouldering but the flames were gone. Meanwhile the pilots were notified and an emergency return to Düsseldorf was initiated. The plane landed there safely after a total of 13 minutes flying time. The investigation by the German Federal Bureau of Aircraft Accident Investigation (BFU) showed that there had been eight previous instances on A330 aircraft of failures of the power supply unit built inside the door. None of those involved fire. Airbus was in the process of replacing these power units due to these failures. The BFU concluded that condensation had formed in the door area due to climatic conditions. Moreover, water from the outside was able to penetrate into the door when it was open. The water then reached the power supply unit. The protection of the power supply unit from the environment should have been sufficient according to test that had been carried out. However the protection was insuffient when actually installed inside the door. This led to a short circuit. The energy released during the short circuit led to a fire.